Did you buy far too much Sardines? Did you see their silver skin shinning on the fishmonger’s desk and thought… MMmmm I could have them grilled this Saturday and invite the family over… but then the weather turns rainy and stormy and you change your plans. It’s a perfect situation for a Pickle! Preparing a Pickle or Escabeche (that’s how we call it here) it’s one of the easiest things to do and you can use the sardines in a pickle in so many different ways afterwards. 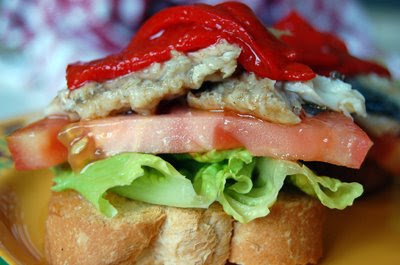 For example: In a sandwich or bocadillo (bocata is the popular word); to do some Montaditos (see picture hereunder) with layers of different ingredients; as part of a salad with pasta, sardine, lettuce, blah. There’s many different ways to perform a pickle, feel free to add other ingredients. Now to the Award! Always smiling Judy from No Fear Entertaining sent me over this cute award: Thanks so much Judy, I love your blog t♥♥!!! 2) Laurie from Mediterranean Cooking in Alaska: A cook poet in Alaska. 3) Janet from GourmetTraveller: Magnific Chineese food cooked in Switzerland. 5) Nathan from La Cocina de Nathan: Latin cooking in North America. Adelante Chico! 6) Ts and Js from Eating Club Vancouver: Fantastic food and pictures ready to be devoured! 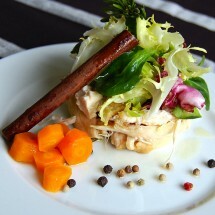 7) Antonio from Olive Juice: Recently discovered and still drooling with his pictures and recipes! 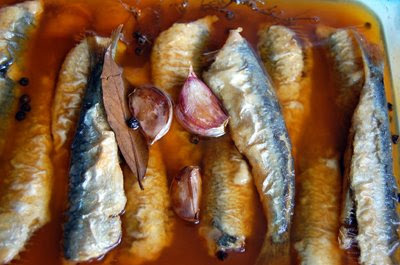 Ingredients for 4 servings: 16 fresh sardines, oil to fry them, flour and salt. 6 garlic cloves, 200 ml. of white wine vinegar, 100 ml of water, 1 bay leaf, 1 teaspoon of black pepper, 1 tablespoon of sweet red paprika, 1 thyme branch. Clean the sardines under tap water taking their head and guts away. Let them dry a bit. Heat some olive oil in a sauce pan. Coat the sardines in flour and fry when the oil is hot. When done place over kitchen paper to leave there the excess of oil. Place the sardines in a glass recipient. Don't take the skin off the garlics, just smash them with a plain knife and fry in the same sauce pan with the same oil, add the bay leaf, the pepper and the thyme branch. When the garlic starts to get some colour, take the sauce pan out of the heat and add the paprika. Stir so that it doesn't burn. Add also the vinegar and the water (careful it can splash you). Stir and put back over the heat. When it starts boiling pour it over the sardines we had in the glass recipient. Make sure the pickle covers them. Let it cool down and when cold place in the fridge. I love escabeche. In my family, it was traditionally done with mackarel but I think any fish works. It’s been quite a while since I’ve had it but, looking at your post, I’m adding it to my shopping list right now! P.S. It was hard to concentrate on the ingredients when “Silly Me” kept flashing. Very funny. Very good blog! Hey, Nuria. Thanks so much. Another award which I am passing right back to your, as you know how much I love you, your blog and I enjoy reading your posts. Your sardines look delicious. Hi Joan! I love it with Mackarel too!!! Those blue fish are soooo tasty and good for our health :D. The silly me slide is part of a video I did for my 1 year blogiversary ;D.
Thanks so much darling Ivy! 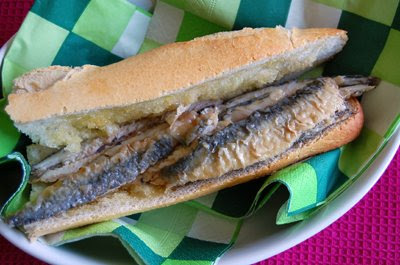 Ummm, Nuria you KNOW I love sardines and the next time I get some I’ll try this. Us Greeks call escebeche “marinato” where the fish cools in the marinaade overnight before serving. yes im still here! just got caught up last weekend with an unexpected essay on spanish conquest of mexico(hmm hehe) senior year is tough and im only three weeks in! and i have two jobs! BUT ive been working on a post and its up tonight or tomorrow morning! no way am i disappearing!!! Yay – it’s working now! I love the idea of this – but when would you remove the bones?? There is still a bit of me that fusses like a schoolkid when it comes to fish bones – even though fish is my favourite thing! What a mess with the comments!!! My answer to the Peter was to Peter M.
I’ll be devouring your next post, guapa! That dish looks mighty delicious! In a sandwich… yummy! Cheers and thanks for passing by! I’ll add this when I do another recipe post before this weekend is over then I’ll just make it part of the post the same way you did. Thank you for the award, Nuria! We’re truly honoured. 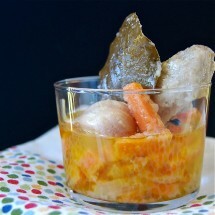 I love these sardines escabeche. . .I think I saw some sardines at our grocery store so I’ll try this soon. Thanks! Primero, antes de todo, felicitaciones a ti por recibir el award!! Te lo mereces y mucho mas!! También, miles de gracias por escogerme como uno de los recipientes! hoy tuve un día de trabajo brutal y fue un honor ver q me hayas elegido! Nunca he cocido las sardinas de etsa manera, pero ahora casi todo los días me está provocando comer cosas con sazonadas con pimentón!! q ricoooo!! Thanks for the love! =) We’re honored. Hola Maryann! He, he… love to behave silly sometimes!!! Thanks Rosa! Nice to see you over here :D. Hope we keep in touch! Ok, Nathan! YOu deserve it :D!!! Here you are Valli! I’ve been missing your comments lately. Still going to the beach? Nuria, this looks just perfect for me. I learn yet another wonderful trick from you again! 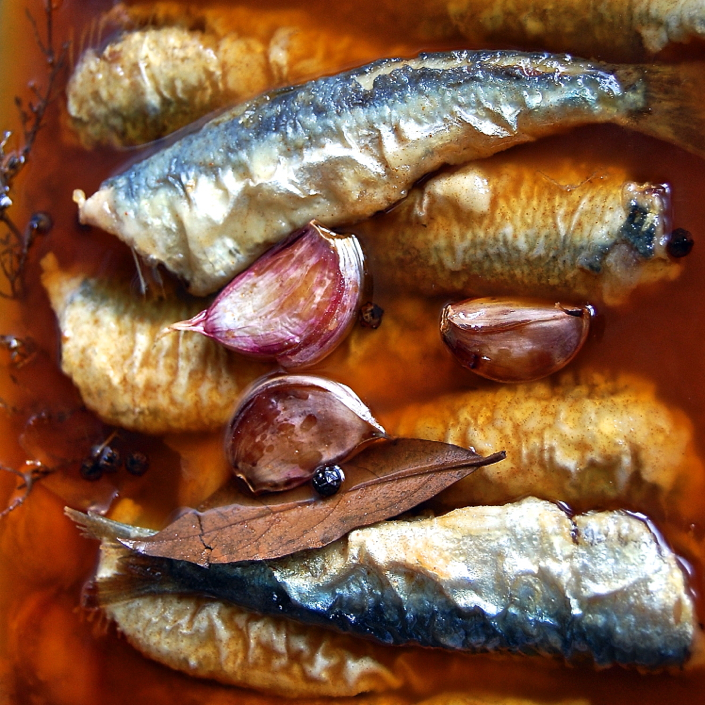 I LOVE sardines, and I’m always looking for new ways to prepare them. These look so delicious, Nuria! I love fresh sardines, but have never had them this way. Thank you so very much for the lovely award! I’m very touched. Yum, again! did you know that “in a pickle” also means “in trouble”?